In a few hours I hope on an airplane to go visit my parents for the weekend. My parents are of retirement age and native New Yorkers: both born and raised in the Bronx, having lived the bulk of their adult lives in the New York metro area. So, it stands to reason (according to anyone who is a “member of the tribe”) that they would end up in Florida. 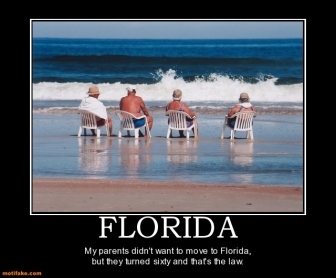 We actually moved to Florida when I was a teenager. I suppose they just wanted to get a jump on things. However, a few years after their nest was empty they committed to their final “resting” place – a corner condo in the lovely Colony Point retirement community, where my father (if I am up to date on my records) currently resides as President of Building 4. Besides keeping busy with his leadership duties, my parents both have a pretty active schedule. My father with his near-daily breakfasts with buddies at the local diner or deli and my mother playing Mahjong or mingling at the pool even though she frequently gets angry stares and snickers from the more seasoned residents for choosing not to wear a cover-up and tempting their husbands’ wandering eyes. My mother is the spritely one in the community – at a tender under-70 age range. Winter is always a bit more active, when their snowbird friends come to town – but summer can get a little slow and hot and sluggish. That’s when they spend more time walking around the mall across the street to be able to get out of the house but still enjoy air conditioning. Colony Point is not the only retirement community in their city, either. There is also Century Village. Both are located fairly close, albeit on opposite sides of town with the hospital literally in between the two. I often wonder why they insist on naming these complexes with words that remind people of how old they are: “colony”, “century”, etc. But that’s a tangent for another time. I suppose I understand the draw of the pilgrimage: you get old and don’t want to be in the cold any more. Then there is the distinct cost-of-living advantage of a state with no state income tax and the ability to live pretty cheap on a fixed income in general. But why is it such a Jewish thing? The state of Florida and South Florida in particular has a disproportionate amount of old Jews like my parents. I wonder if it’s because we discovered this (in theory) lovely place to spend our golden years that is economical and has a critical mass of our kind? Is it our inherent financial horse-sense (look – it’s a thing. I hate to say it, but I believe it to be true)? Or have we just achieved such a critical mass that we have deemed Florida a new type of Zion and stocked it with lox, bagels and early-bird specials? In any case I will look forward to the visit this weekend and hope to capture a few Sienfeld-ian bloggable moments. For those of you who would like to understand more about the ethnographic experience of retired American Jewish culture – I highly recommend watching some Seinfeld episodes. All I can say is, art often accurately reflects life. And this sub-culture is a particularly colorful one that I feel privileged to enjoy. My wife and I look forward to getting out of the cold and taking our wasp selves to New Orleans for our retirement years. Yes, I would love for you to illuminate, with your contextual insight, what the whole New-York-Jews–Flocking-to-Florida thing is about. My own Jewish parents would drag me to Florida for family vacations while I was growing up and my memories are clouded with mucky swampland; damp air too thick too breathe; insects and reptiles galore; more scrapple and barbecue pork and stuff fried in bacon fat than a finicky teenage vegetarian would care to encounter; miles upon miles of nothing but shabby roadside gas stations and pawn shops along the so-called highway; and, above all, the commercial-driven and denial-based cheeriness of Orlando (which, IMO, only alienates people from their barren lives even more than they already are). I had that thought that relocating to Florida was a trend come and gone among Northeast Jews of the older generations, but my sister (in her 30s) still likes to vacation there with her own family now–in Orlando, of course (shudder).